This is a drill to train a quick transition from defense rebound to execute at the offensive end and make your big man run. O2 throws the ball against the backboard and rebounds the ball. O1 sprints into position to get the outlet. O2 passes the ball to O1 and sprints up court to get the rebound at the other end. O1 dribbles the ball to mid court and passes as soon as possible to O3. Make sure, that O3 is in one fluid motion when he catches the pass and don't stop to wait for the pass. O3 executes with a power move or a lay up. O1 sprints in position to get the outlet. 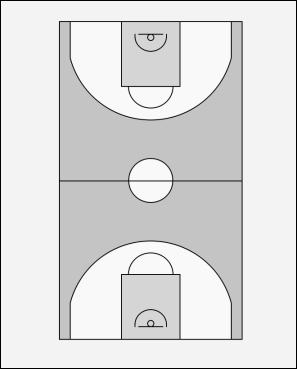 After his shot O3 fills the lane and sprints up court. O2 goes for the rebound. The drill continues, at the other end when O4 rebounds the shot of O3. Every Player should run every position 4 times. Every turn should be done in 12 seconds.